India’s Reliance Communications (RCOM) has sold its tower business to Canadian private investment firm Brookfield Infrastructure Partners for $1.6 billion. The deal was announced in October. 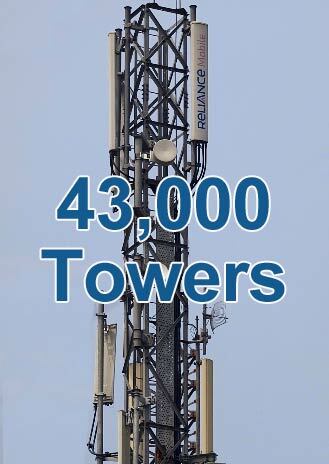 RCOM and Reliance Jio, the telecom arm of Reliance Industries Ltd, will continue as major long-term tenants of the new tower company, along with other existing carriers on the 43,000 towers. In addition to the upfront cash, the company will get a 49% non-voting share in the tower company. It will look at selling the rest of its economic interest in the venture at a later date. The transaction will represent the largest ever investment by any overseas financial investor in the infrastructure sector in India, and is a strong reflection of the confidence of the international investment community in the long term growth potential of the Indian economy. In 2015, American Tower Corporation bought a 51% stake in India-based Viom Networks. The company acquired approximately 42,000 communications sites for $1.17 billion, approximately $28,000 per structure. The recent RCOM deal averaged $37,000 per tower. According to American Tower, the cost of building a new cell tower in India is between $40,000 to $60,000.